I arrived in Cairo on the 30th of January which gave me three whole days in Egypt to prepare myself for the biggest challenge of my life. Despite all the months of training and countless miles racked up over the last year I still couldn’t help but question my ability to complete this race. I knew I could cover the miles but I just had no idea how long it would take me… Would I need to sleep a lot between sessions? Would I recover after sleeping? Would I stay injury free? Would I have enough batteries for my gps and head torch?! That would without a doubt be a total classic moment of stupidity. Months of running and training to power up your own internal batteries, and you succumb to retiring from the race due to the poor performance of the Duracell bunny! I’m glad to say that having met the race organisers and the other runners I was feeling far more confident about the race and felt 100% sure I’d nail it. All that was left to do before leaving for the white desert was to organise the mp3 play list and pack my drop bags for the 10 checkpoints that are laid out throughout the race. Music was easy, but the drop bags were just hilarious. Initially this was a well though out process. 15 miles in I’ll not need much… 30 miles in I’ll need a meal, 45 miles in I’ll need warm clothes… Soon it became a process of chucking things in random bags. What was the point in thinking “at checkpoint 7 I’ll need breakfast” etc. Who knows what time I’ll get to CP1 never mind CP7!! So I decided to just space out all of the food randomly and hope for the best. As for warm clothes, I just decided that I’ll use whatever I can carry. On the 2nd of January we left the hotel and set off into the most dangerous part of my trip. No, not the race. Not even the riots… The Egyptian school of driving! To make matters worse, the bus that was to take us 300 miles into the Sahara kept on stalling every time we slowed down. 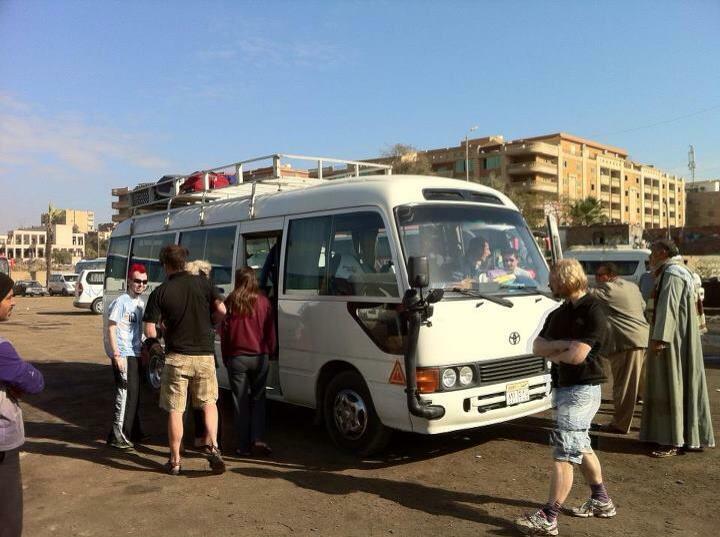 Thankfully we switched buses before we got out of Cairo. Otherwise it may have been a few hundred miles of walking before we even start running! The race camp was immense! Arriving at the camp at night was perfect, all you could see were the silhouettes of the mushroom rocks and the light from the camp and the camp fire. Even at night it just seems like you’ve landed on another planet. Walking through very soft sand at this point was also a very poignant reminder of the task that lay ahead. Was I nervous? Nope… At this point I was thinking this was worth all the miles, minutes and money I have put into this. I was excited to say the very least. Before bed we were given a briefing by Keith (Fat feet Chief) and Diaa (The master of the desert), we were fed and watered (In onesie’s!) before trying to sleep. Sleep wasn’t easy. The beds in the camp were fantastic, it literally couldn’t have been more comfortable. My deafness even came in handy for blocking out the snoring of other runners! It was pretty cold that night, but the real reason for the difficulty of sleeping was the pure excitement. I don’t think I’ve ever felt like that since I was a child on Christmas eve wondering if Santa has been. So after a night of very slight sleep, I woke up tired but still very much excited. 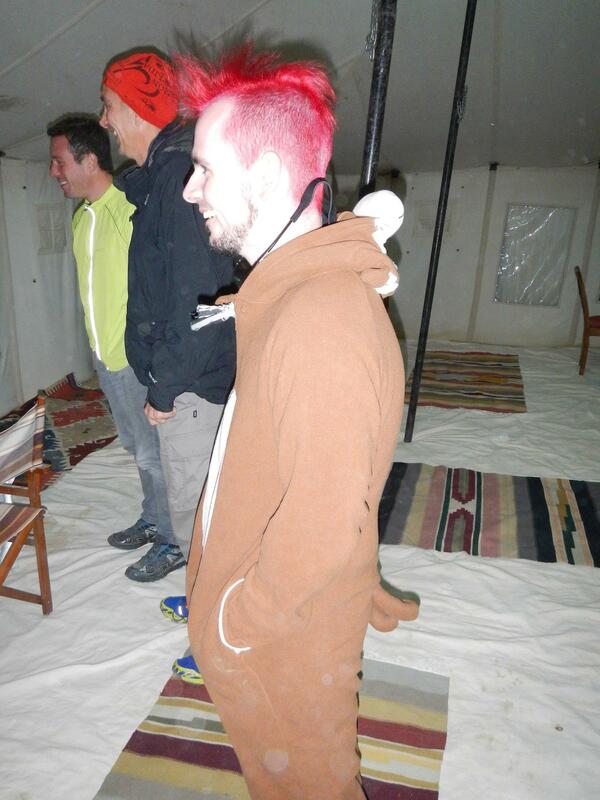 Then I realised what I had just done… I spent the night sleeping in the desert in preparation of running 160 miles, undoubtedly the toughest thing I have ever set out to do… and I woke up dressed in a monkey onesie. In my defence it was very cold that night!!! At this point I’d like to highlight that the onesie idea was down to Sarah and Amanda. Not that I’m embarrassed or anything! After breakfast I got geared up and ready to run. We had another quick briefing with Keith and Diaa, we were handed out our flares, then we boarded the Jeeps to head out to the start point. Somehow at this stage everyone seemed pretty relaxed. Maybe I’m bad at reading people, but I think at this stage you realise there is nothing else you can do. The training is done, the running gear is on and the race is set. What is there to be nervous about?! So we set off at 12pm on the 3rd of February and I decided that my pace was to be as slow as possible for as long as possible, walk the hills and run the flats and down hills. Although I’ve no idea what the temperature was at the start I’d guess and say around 20 degrees C. I quickly found pace with 3 other runners (Matt, Sarah and Amanda) . It was great running with them, and was a good way to keep a steady pace. It was also brilliant to enjoy the most amazing scenery I’ve ever seen with a great bunch of people. I can’t quite describe how amazing and beautiful the views are in this part of the world. 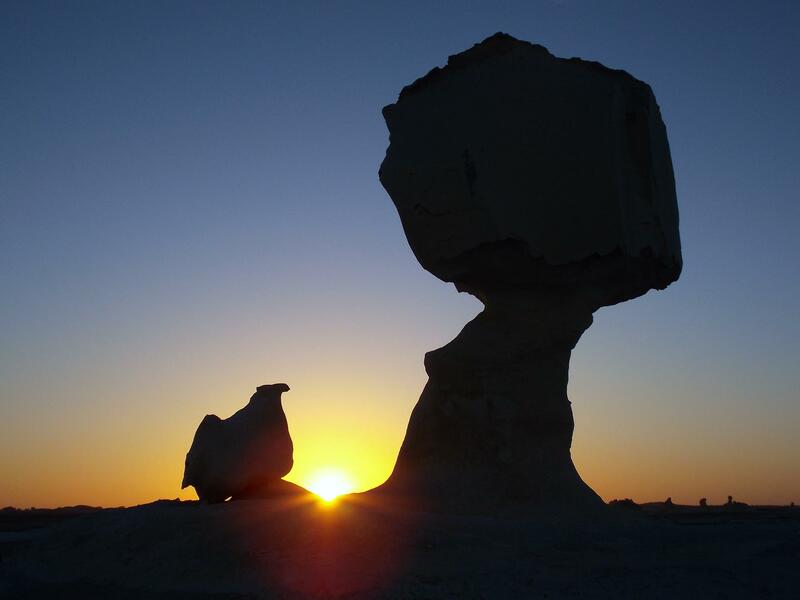 The photos of the race can give you an idea, but somehow a camera doesn’t seem to capture the sheer scale and surreal nature of the white desert. After about 25 miles Matt and myself broke away from Sarah and Amanda. It was inevitable that our pace would change during the race, and it is very hard to adapt to 4 different peoples pace not to mention the need to stop when any of us had a niggle, needed to adjust, or even just needed to pee! We reached CP 3 (45 miles or so) early in the morning – 6/7AM I think. 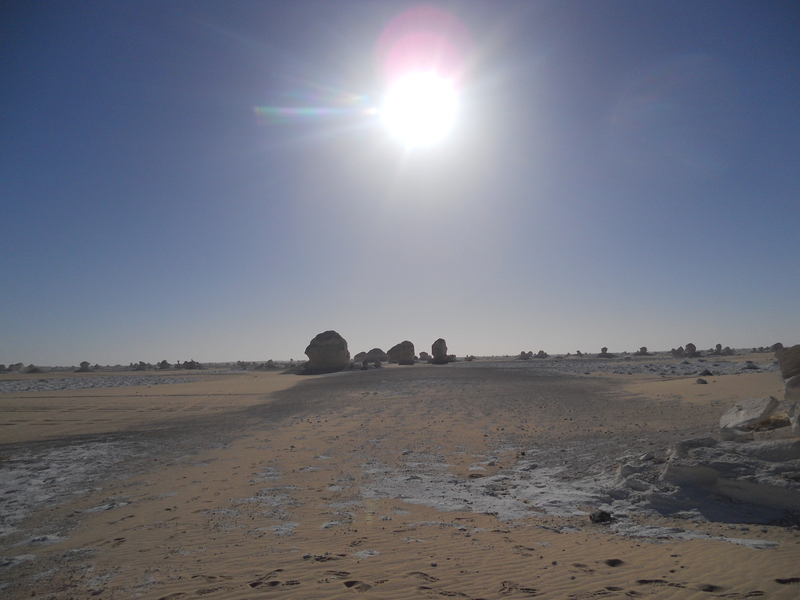 We had a sleep and and set off back into the desert around 10am. In hindsight we shouldn’t have slept and pushed through to CP 4 while it was still cool. However, we didn’t think for a second that it was going to be far hotter than it was the day before. Our journey to CP 4 (around 15 miles) started off fine, but as the sun started to get to it’s peak things got very difficult. I think the temperature got into the mid 30’s. I’ve been scared of the mid 30’s ever since I turned 30! Anyhow… Both Matt and myself were struggling to focus and I kept hallucinating. It started off with seeing poles right in front of me, which forced me to put my hands out and jar to the left or right. Very annoying!! Then I kept seeing two men locking gates in front of us. Matt was doing great and kept us heading in the right direction. I thought Matt was in far better shape than me at this stage, in fact I’m pretty sure he was. My ability to judge anything at that stage was pretty non-existant in fairness! We eventually got to CP4 and we were both shattered. After having rested at CP 3, a 15 mile run/jog/walk/sit/cover had sapped all of our energy. I taken off my shoes (something I didn’t plan on doing at all!) as my feet didn’t feel to good at this point. 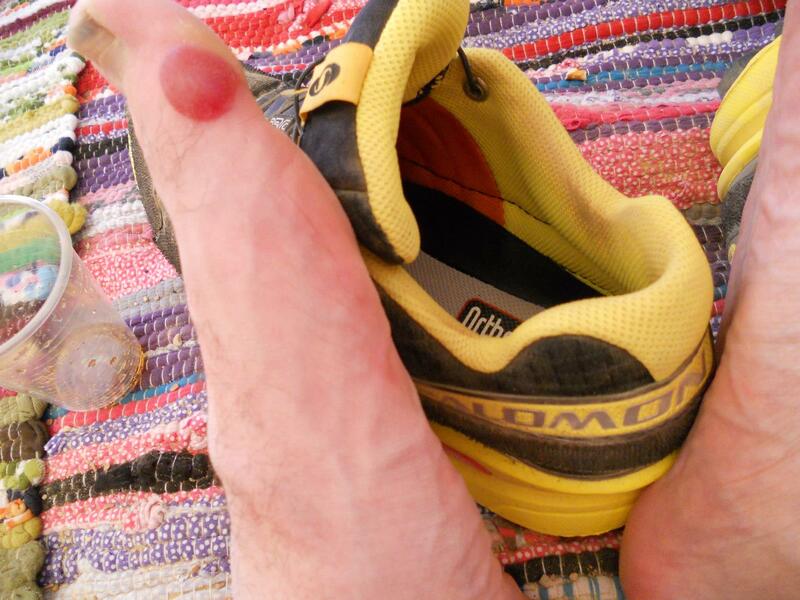 Aside from a couple of small blisters my right foot was ok. My left big toe was not so lucky! A giant red blood blister was protruding from my toe and looked like something you’d see on red nose day… on a nose! Thankfully Keith was there and he proceeded to lance my red nose day blister. After a good bit of taping, eating and drinking I was ready to go. Matt had patched himself up physically, but he said the last stage had taken it out of him mentally and he was convinced he was going to pull out. I can totally understand this, and coming up to CP 4 I’d be lying by saying that thought hadn’t crossed my mind. Those 15 miles were the longest miles in the race. In some way’s I think the blister on my toe helped me. It was a physical distraction from the mental trauma of the last 15 miles and I was more focused on the blister than I was of anything else. Sarah and Amanda arrived at CP4 about 30 minutes or so before I set off. They had found the last section tough as well and I think the reality of just how tough this race is was beginning to set in with all of us. This was no stroll on the beach! I geared up and set off with the aim to run a further 30 miles that day. By the time I had set off the sun had started to go down and the temperatures were becoming far more bearable. Just so you know, the sun was at it’s peak at about 12pm and it was dark by 5.30pm. This meant there wasn’t a great deal of time when the sun was so hot and I revised my running plan to get out as many miles as I could outside peak sun times. The stars were simply amazing! You’d think in the dark tranquillity of Loch Ness I’d be spoiled with a clear sky. The desert stars were mesmerizing, but they were also a great tool for keeping you running straight during the night. Although the GPS points you in the direction you need to go, you have to hold up your wrist to see it. During the day this was usually fine as all you had to do was focus on something in the distance. 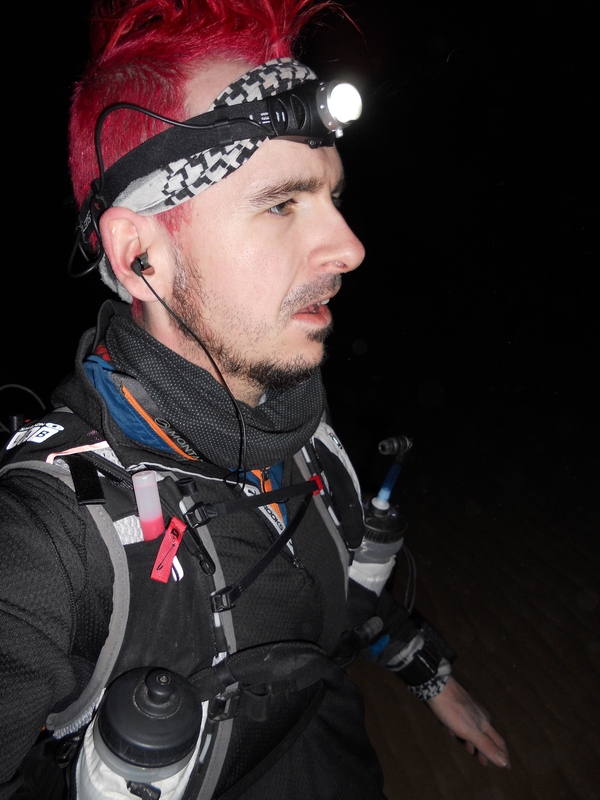 At night however, all you could see was the small space of land in front of you that the head torch lit up. The stars were a very useful guidance tool! Between CP4 and CP5 my batteries died on my GPS. I was expecting that to happen at some point and was easy to replace the batteries etc. However, I couldn’t remember the Way point I was on! (In between each checkpoint there are way points that kept you running on the right track.) I made a decision on a way point and went for it. After about a mile I was beginning to think I’d skipped a way point. I certainly wasn’t heading backwards, and the route didn’t seem like one that would have been planned. After climbing and descending about 20 dunes literally one after another, I found it hilarious! 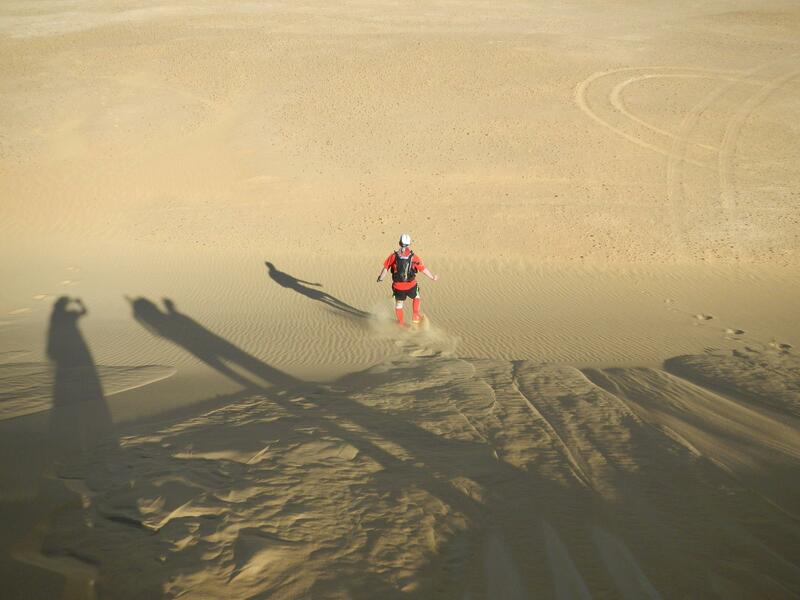 Realising I still had over 80 miles to run, and here is me traversing dunes! Whoops. At the top of one of the dunes I even found a Camel skeleton! If the Camel’s can’t make it what chance have I got!? Eventually I got back on track and was bounding along towards CP5. After refilling and refuelling I quickly set off towards CP 6 after about 30 mins. At this stage I was buzzing to the max! Runners euphoria, feeling invincible and raring to go. The route to CP6 was a short hilly stage of around 8 miles. 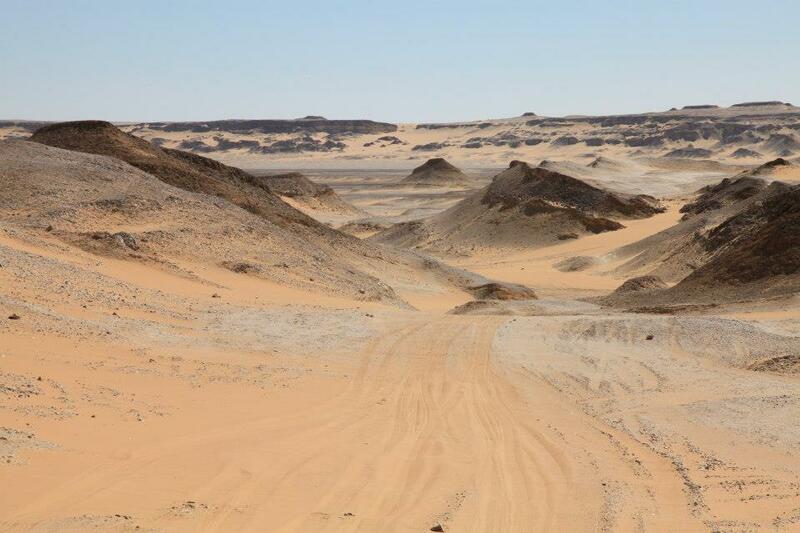 Yeah… more dunes! Just what I needed after my hilly detour! Despite facing more dunes this was probably one of my best stages, and although I haven’t seen the splits for the race it wouldn’t surprise me if this was my best section. 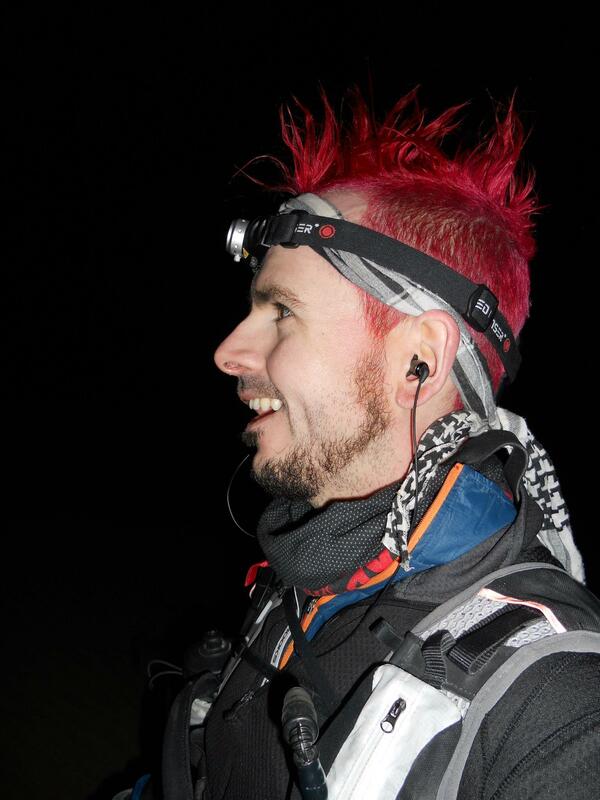 I got to CP6 and was still feeling fantastic despite having covered 148km (92 miles) in just over 40 hours. I stayed at CP6 for about 30/40 mins and chatted to Adrian (Fat Feet’s Fire breathing motivational guru) for a bit, had some food, refilled the water bottles and set off for CP7. This was brave, and probably a bit silly. Had I fully thought about the prospect of running a further 18 miles to the next checkpoint, I may have decided on a short rest. Typically the competitive side of me was kicking in and I was thinking about pushing for 4th/3rd place. I wasn’t sure if I was in 4th or 5th at that point and forgot to ask at the checkpoint. I set off for CP7 and I convinced myself I was in 4th place. That alone was pretty motivational, but it also made me really want to push the pace. About 2 miles in I felt my right Achilles becoming quite tight. Eventually tightness became pain, then struggle to run pain, then eventually struggle to walk pain. The sun was back up and was beaming down with a vengeance. I had ran out of water and had about 3.5 miles until the next Check point. The hallucinations were back and I was seeing gardens, more locked gates and even people! I wasn’t even managing a walking pace though and the right leg had really ceased up. With 2 miles left and having been without water for an hour, my leg and head were telling me my race was over. I was seriously angry and annoyed, but realised I had to get help. I slowly made my way to a point where I thought I’d be visible and set off my flare. Even having decided I needed to do this, it was still incredibly difficult to actually fire the flare. To me, it just signalled the end of my race. Eventually I fired the flare and waited about 30 mins. I signalled with my signalling mirror as the Jeep came into view and I was found. I was a bit delirious at this stage due to a few factors I reckon. Dehydration, emotion, anger, tiredness, pain… Will (the Physio) and Philippa (the Doctor) were in the Jeep, so I couldn’t have hoped for a better team to find me! After getting me hydrated and assessing my leg, both Will and Philippa were convinced with some rest and exercises (and painkillers!) I might be able to continue the race! After a couple of hours Tom, Tony and Bryan (Three of the other runners) arrived at the checkpoint. They found that section pretty tough too and were looking forward to a good rest at CP7. At this point I was thinking of resting for another hour or so and getting on with the race. The guys convinced me that was a bad idea as I looked shattered. Inside I knew I was tired but I was also desperate to try out the leg! Eventually I gave in and went to sleep, and I’m glad I did. I reckon that if I didn’t rest my leg probably wouldn’t have lasted. Thanks to the guy for keeping me sane! Sarah and Amanda arrived at the tent at some point then as well. The fact that all these details are blurry only go to show that I made the right decision to rest. I then slept for over 10 hours, and it was the easiest/best sleep ever! I was moved during the night to make room for others in the tent, apparently I even spoke as well! I can’t remember any of this at all. Sleeping to the max! The next morning I got up, Will worked on my leg for a bit then I got up and gave it a go. Initially the leg was very weak and was giving way. I remember punching the floor (gentility but angrily) as I got up, and uttered something along the lines “F#ck off leg” and zipped up the man suit! This was it, make or break. I had no desire to get a DNF. I was finishing this race and that was that. I bid farewell to Sarah and Amanda and set off for CP 8. I quickly discovered that I could run but I couldn’t walk. If I fully planted my heel the pain shot up my leg, but if I kept a light run going it felt ok. This whole stage was great and the leg was holding up well. The last hour or so of the CP was in a sandstorm, but aside from that it was ok! The sandstorm was a bit of fun actually, it was a good distraction from the leg. When I got to CP8 I found out that they were holding all the runners at the checkpoints until the sandstorm clears. The way the leg was feeling at this point I would have rather continued,but thankfully the rest didn’t change the way the leg was feeling. 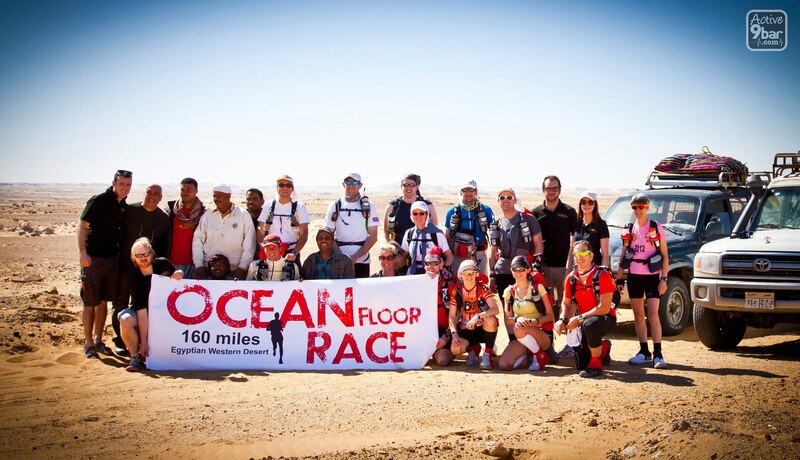 After about 4 hours the race resumed and we all embarked upon the final 30 miles of the race. I remember thinking “Only 30 miles”! That seemed like nothing, the race was nearly finished. I knew I had it in the bag, I just had to keep on going. Slightly hilly to CP9 but it went by smoothly. I stayed at CP9 for about 1.5 hours and had some food and a nap. I then set off with the plan to finish the race. The run to CP 10 was only a short stage so I only stayed a couple of mins in CP10 and set off for the final 10.5 miles. By this point it was 2am or there about. Pitch black so the scenery wasn’t fuelling my running at this stage. To be honest though, the fact that I was less than a half marathon away from finishing a 160 mile desert Ultra Marathon was all the fuel I needed!! Cloud 9? I was on cloud 160 at this point! Plenty of singing and run dancing was accompanying my last 10 miles. Good thing I wasn’t spotted like that. People might have thought that a man with blood red hair, running, singing and dancing at 3 in the morning in the middle of the Sahara desert was a lunatic! People are so judgemental. I remember uttering the mantra “Feet don’t fail me now… take me to the finish line” on several occasions in the last few miles (Thanks Sarah Chugg!). Music had given way and I really was just talking myself through the last big push. You could see the finish line from about 2 miles away, it was great motivation and anticipating crossing the finish line was mouthwatering to say the very least. I picked my pace up (probably not but it felt like I did) and just kept on running. “160 miles, 160 miles, 160miles” I remember thinking that a lot in the last few miles. Nothing in my life has been as big a challenge as this and I was about to finish what not so long ago seemed an impossibility. I crossed the line and was greeted by Keith,Will, Adrian and Sarah (sports masseuse extraordinaire!). What can I say? It was just amazing, life changing, sheer euphoria… It’s a feeling that is like no other. I thought finishing a marathon was great (and don’t get me wrong, it is.) but this was just on another level. Would I do it again? Yes, in a heartbeat. This has been a fantastic race, organised brilliantly and I have met so many fantastic people. Congratulation’s to everyone in the race! 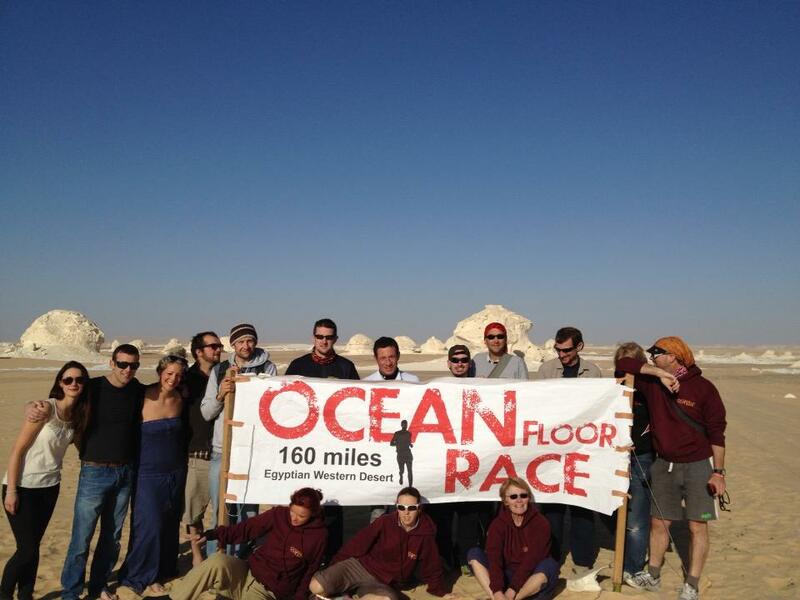 I will do the Ocean floor race again next year and I’m going to run a few more ultras this year as well. Time for another Jamie special though… I’m not content with 160 miles, I want to push it much further. How much further I’m not sure, but I’m thinking of a coast to coast race somewhere. So yes, I have been bitten by the running bug! Not that you didn’t know that anyway!! ← Coming to feet near me! Coming to feet near me!